Peaked roof vent prevents buildup of moisture-collecting debris on backside of roof vents. Grain bin roof leaks from corrosion can be reduced with Sukup Manufacturing Co's., new peaked roof vent, designed to prevent moisture and debris such as fines, dust and bee's wings from collecting in the valley between the sloping bin roof and the back side of roof vents. The sloped V shape of the bak of the peaked roof vent channels debris and moisture around the vent. The patented device is made of low-density polyethylene with a UV protecting additive to prevent sun damage. The peaked roof vents can be easily retrofitted to existing bins to protect the roof and increase the ventilation inside. 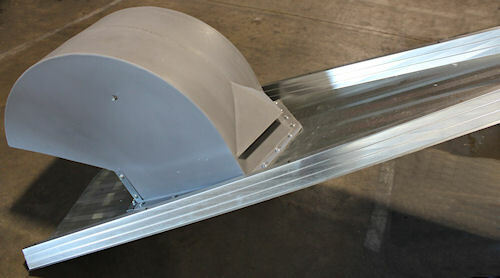 For more information on the peaked roof vents, visit www.sukup.com, or call (641) 892-4222. Sukup's new 18-inch peaked roof vent is designed to prevent moisture and debris from collecting in the valleys between the sloping grain bin roof and the backside of roof vents.